The TV team that maintained law and order in Laramie, WY, in the 1870’s was granite-jawed, 6' 4" ex-Marine John Russell as Marshal Dan Troop and his deputy, Peter Brown as Johnny McKay, a competent backstop for Russell’s taciturn Marshal. Reportedly modeling the no-nonsense Troop after a superior in the Marine Corps, John Russell as Troop personified law and order in its purest form…rugged, deadly serious, intelligent and dedicated. He could also be stubborn and unyielding in the face of duty, becoming possibly the most confident lawman on television. By playing it straight down the middle, Russell made Troop believable. In counterpoint, Brown’s Johnny McKay was respectful, disciplined and brave, although at times restless and brash. 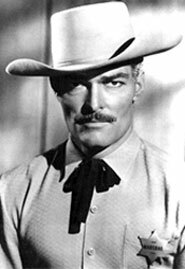 ABC, although already rife with Warner Bros. Westerns, believed in “Lawman” and added the half hour series to their Sunday night lineup from 8:30-9pm Eastern as of October 5, 1958. Contending with hectic schedules, skinflint budgets and a myriad of writers and directors who were never given the time or money they got at other studios, the two stars, along with producer Jules Schermer, were the constants who maintained the high quality of the show and the consistency of the characters. Schermer Complained that break-neck production schedules meant directors often had no time to take into account any of the subtleties of the script, including characterization. Apparently Russell and Brown both understood Schermer’s perspective: “The success of the TV drama depends on establishing a particular tone. A television episode is basically only an incident built up with characterization. If a director plays the characterization wrong…the total effect of the teleplay is destroyed.” Russell and Brown maintained that strong mentor/protégé characterization, developing a growing relationship between Troop and McKay. As for other regulars, Dan Sheridan was Jake the bartender while Bek Nelson as Dru Lemp was weakly offered as a sort-of love interest for Peter Brown in the first season. 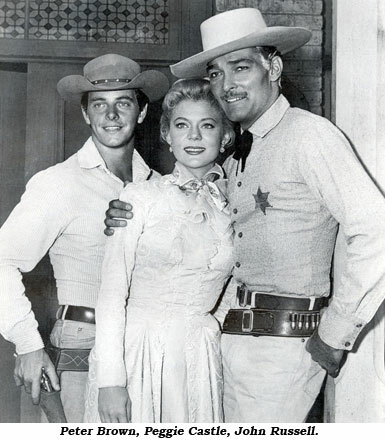 With that idea going nowhere, although producers denied they were “borrowing” from “Gunsmoke”, at the beginning of the second season gorgeous Peggie Castle was added to the series as Lily Merrill, owner of the Bird Cage saloon. Marshal Troop, although obviously attracted to Lily, remained (like Marshal Dillon) cautious in his relationship with Lily who ran her saloon in an orderly manner with no sass from disorderly cowpokes. An excellent choice, Castle added greatly to the series which rose to 16th in the Nielsen ratings during the second season. 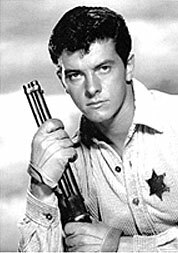 For the first two seasons of its four season run “Lawman” followed “Maverick” on Sunday nights followed at first by “Colt .45” and later “The Rebel”. The show’s primary competition over its four season run was the popular CBS Sunday night staple, “Ed Sullivan.” (“Lawman” aired opposite Ed’s last half hour.) NBC, never a factor in the first two years, struggling with “Steve Allen”, “Pete Kelly’s Blues” and others that came and went, rebounded in season three (‘60-‘61) throwing the wacky comedy “Car 54, Where Are You” up against “Lawman” followed by “Bonanza” in color. Additionally, ABC broke up their terrific night of all Westerns, adding “Follow the Sun” and “Bus Stop” to their lineup. By April of season four (which began Sept. 17, 1961), with Westerns on the wane, ABC replaced “Lawman” at 8:30 with a Sunday night movie and moved “Lawman” to the 10:30pm basement, an essential death knell for the series which finally saw its last ride on June 24, 1962. Reruns continued through Oct. ‘62. For all concerned with “Lawman”, they can look back upon a job better than well done.